Lament and indeed Obolus passed me by when this record was originally released and as such, I've decided to give this release the attention it truly deserves. Obolus are a mysterious band. So mysterious in fact, that they don't even seem to have a presence on social media sites. 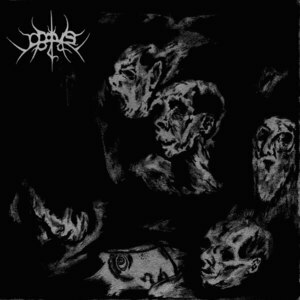 They play grim, desolate black metal and hail from the US, with only a demo to their name prior to this release. Lament was released as a 10" by Flenser Records in 2012. I approach Lament with a feeling of trepidation for what I might witness, such is the mystery surrounding the band. That trepidation is promptly blown away by the howling feedback that greets me at the start of EP opener Desolation. The noise level here is almost overwhelming thanks to the relentless guitar and those blood curdling screams. It's almost enveloping! It makes for very uneasy and unsociable listening; such is its power, with little room being left for solace of any kind, throughout its five-minute playing time. Reflection allows you time for just that, with it being a calming instrumental interlude of abject beauty. That calm however only lasts for a short time, as the peace is shattered by Hatred. This time, as well as the shattering guitar and drumming there are string elements that add some melody, albeit harrowing. If you give Lament enough attention, you can pick out some amazing subtle nuances within the instrumentation. The production doesn't make these moments very obvious, because the instruments are allowed to weave into each other to help generate Obolus's harsh noise. The sound of rain heralds in Grievance, which is also the lengthiest song on Lament. Those with a nervous disposition or an intolerance for intense extreme music will no doubt have turned off at this point, but if you're still with us, you'll be experiencing the slow build up of droning riffs, which make you sit tight in expectation for a crescendo and after a brief pause, that appears with the next black metal barrage at about half-way. Maybe not as majestic as you might have been expecting, but still very scary. The last sermon is the title track, which fades in to view with the sound of rain and then gently plucked guitar and strings. It's another calm and beautiful instrumental piece and acts as the outro to the record and what has been an epically dark and abject experience. This EP is a stark reminder of the mysterious enigmas that make up the black metal underground. They will leave a sizeable mark on you if you let them and for that they must be applauded. You can pick up the vinyl version of Lament from Flenser Records at http://store.theflenser.com/.